A few weeks ago, Bernalwood’s search robots brought an interesting headline to our attention: “Enterprising Filipina opens hip cafe in hot San Francisco neighborhood.” The accompanying article tells a very cool story about JoEllen Depakakibo, the fashionably caffeinated Filipina entrepreneur who opened Pinhole Coffee on Cortland Avenue. “[Bernal Heights] was the type of neighborhood I was looking for, a mix of the old and modern, giving me the feel of the 1950s,” Depakakibo related. Members of the Occupy Bernal movement are currently fighting to save homes from foreclosures and maintain diversity in the neighborhood. When Depakakibo chose Bernal Heights for her venture, she was not yet aware of the history of Filipinos in the neighborhood. The number of Filipinos in Bernal Heights spiked starting in the late 1960s and early 1970s because of the passage of the Immigration and Nationality Act of 1965, which paved the way for immigrants from Asia, Africa and the Middle East to become permanent residents in the U.S.
One afternoon, Carvajal went to Pinhole to have a cup of java, and as soon as Depakakibo saw her, she bowed, took Carvajal’s hand, and put it against her forehead, a sign of respect for elders among Filipinos. 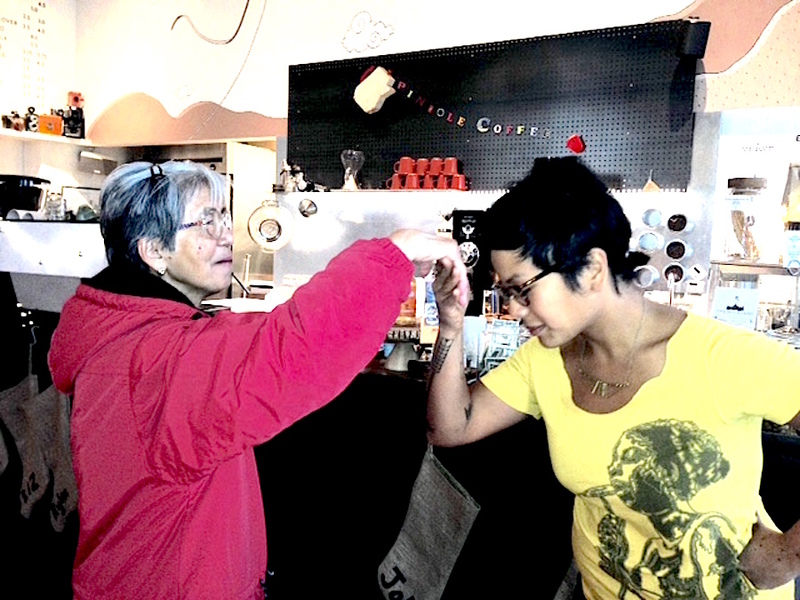 In turn, Carvajal gave her a blessing and welcomed her to the neighborhood, immediately proceeding to tell the young Pinay about Filipinos living and working in Bernal Heights. While decades separated their ages, respect for an age-old tradition and love for coffee and community bonded them instantly. Read the whole thing on Inquirer.net, here. So glad JoEllen injected her energy into our neighborhood! While the colors inside are still fresh and bright, it already feels like Pinhole has been an institution for a long time. I wasn’t thrilled with another coffee house on Cortland but the friendly atmosphere of Pinhole changed my mind. People are actually talking to one another instead of a room full of screens! JoEllen and her staff are wonderful. I, too, was skeptical about the need for another coffee shop on Cortland, but they’ve won me over! JoEllen is awesome – a real asset to the neighborhood. Very friendly staff & vibe! The comments make me chuckle. I think this story and above comments reinforce that we as a community should give everyone the benefit of the doubt before passing judgment on new businesses of any kind. Especially when they are not a formula retail, and it is an entrepreneurs put their own time, money, and passion into creating businesses here in Bernal. Next time someone decides to open a business and people start pooh-poohing it in the Bernalwood comments I’m gonna link to this article. I have been to pinhole a few times and agree it is a very welcome addition to cortland. What a beautiful story. I have lived in Bernal since 1996. Some of my most beloved neighbors have been Filipino. Bill Sorro was a righteous and bravé friend. Thanks Joëllen for joining the lineage! I have lived in Bernal for twenty four years- and now, with this latest wave of gentrification (and I was merely part of a much earlier wave) my block, far from being uniform, has enormous diversity, by both race, ethnicity, nationality and income. House by house : long time Mexican-Americans, Chinese-American, me (Causcasian), New Zealanders, East Coast Jews, Indians. Other side of the street, Germans, African-Americans, American born Indian married to an American born Chinese, Caucasians. To me, that’s pretty diverse. I could not afford to buy my own house now, but I still love it here and love my new neighbors. Love me some Pinhole, and so glad to have some more life near us on Cortland. JoEllen and the Pinhole cafe are awesome!! Great coffee shop with wonderful service. Love this place.